This list of the top-fifteen concerts was culled from more than 100 I attended this year. There were some I missed, due to personal economics, like Herbie Hancock and Return To Forever IV, but as it was, whittling those 100 concerts down to 15 was hard enough. Jeff Kaiser Ockodektet. Nov. 19, UCSD. Kaiser's massive 23 piece big-band delivered a stunning performance of new and old works with solos galore from the likes of Vinny Golia, William Roper, John Fumo, Daniel Rosenboom and Michael Dessen, to name just a few. Maybe the most creative event ever held in SD. Joshua White, J.P. Maramba, Dan Schnelle. Oct. 25, Dizzy's. This trio was perfect for an exploratory set of pure improvisation. I was transfixed the entire 90 minutes, which flew by in a flash. If there is anyone playing more piano than White, I honestly don't know who it is. Peter Sprague String Consort. Dec. 2, Athenaeum Jazz at the Studio. World premier of Sprague's episodic, "Dr. Einstein's Spin," which was commissioned by the prestigious Chamber Music America. The string consort soared and swooped and delivered ridiculously rich sonorities, over which Sprague, BobMagnusson, and Duncan Moore laid it down. Mark Dresser Quintet. May 29, Dizzy's. Dresser's quintet is playing some of the most original music in the world right now. There are few two horn tandems as potent as Tripp Sprague's reeds and Michael Dessen's trombone, and the rhythm section of Dresser, Joshua White and Duncan Moore nailed this extremely complex music in a joyous fashion. Robin Adler & Mutts Of The Planet. Nov. 6, Dizzy's. Adler and her crack band played two of Joni Mitchell's most important recordings, "Blue," and "Court & Spark," in their entirety. Dave Blackburn handled both Joni's & Larry Carlton's guitar parts with ease and Barnaby Finch on piano, Barry Cahill on woodwinds turned in beautiful solos. Adler is a songbird who can really deal with Mitchell's material. Peggy Watson and Cahill handled the harmony vocals and Max Bennett's bass locked in with the drums of Danny Campbell. James Farm. Anthology. It's a coop band, and the equanimity was on display. A very interesting concept in which everyone contributed material, and the solos and features were evenly distributed. Joshua Redman is the big name of the bunch, but here, he was just one of the fellas. It didn't hurt that the other fella's were Matt Penman on bass, Eric Harland on drums, and Aaron Parks on piano. Charles McPherson, Gilbert Castellanos, Rick Helzer, Rob Thorsen, Willie Jones III. UCSD Jazz Camp. This was kind of a private concert, making it feel like even more of a privilege to witness. McPherson and Castellanos were on fire, and Willie Jones threw down. Maybe the best bebop concert I've ever seen. Anthony Davis. Feb. 20, Dizzy's. Davis doesn't play around SD much, which is a shame, because he is a fantastic pianist, composer and improviser. Celebrating his 60th birthday with special NY guests J.D. Parran and Earl Howard on reeds, Mark Dresser on bass, and operatic sopranos Cynthia Aaronson and Susan Narucki, Davis brought a 1975 composition, "Of Blues & Dreams" into vivid life. Leonard Patton & Geoffrey Keezer, Sept. 29, Anthology. Celebrating the release of their collaborative effort, Expressions, Patton's vocal gymnastics blended well with the virtuosic piano of Keezer, and their chemistry was evident throughout the night. Taking on material from Thelonious Monk to '80s rockers Tears For Fears, Patton & Keezer rocked a capacity house. Theo Saunders Sextet. July 5, Jazz Live at the Saville Theatre. Theo Saunders understands the modal dynamics of the post-Coltrane aesthetic very well. Featuring an ace band of Zane Musa and Chuck Manning on reeds, David Dahlsten on trombone, Jeff Littleton on bass and Tony Austin on drums, Saunders took the house down with a wicked version of "16 Tons." Jason Robinson Janus Ensemble. June 2, Dizzy's. Tenor saxophone monster Robinson led an all-star ensemble though some wildly creative charts and posited his own personal take the Coltrane/ Shepp aesthetic. Great band with Rob Thorsen on bass and Duncan Moore on drums, Joshua White and Anthony Davis on piano, with excellent guest soloists, Ellen Weller and David Borgo on reeds, along with many other excellent SD musicians. Mark Dresser, Michael Dessen, Myra Melford. April 17, UCSD. Pianist Melford and trombone master Dessen have a special hook-up with contrabass virtuoso Dresser. I saw this group playing the same material three days in a row, and I wouldn't have missed a single minute of it. Total magic. New Gary Burton Quartet. Oct. 12, Athenaeum at the Neurosciences Institute. Mallet master Burton is back to the vibes/guitar/bass/drums quartet format again, this time with young six-string hero Julian Lage, NYC bassist Scott Colley and ex-Weather Report drummer Peter Erskine. Standing room only, tons of local musicians in the audience. Kristin Korb & Cosmologic w/ Anthony Davis. Jan. 22, UCSD. Korb sang beautifully, accompanied by nothing but her bass, which was rich and sublime. Cosmologic tore through an intense set with Davis sitting in on piano. Incredible stuff. Cosmologic's members, (Jason Robinson/ Michael Dessen/ Scott Walton/ Nathan Hubbard), have all, sadly left the area, but they will be remembered. Chick Corea & Gary Burton. March 1, Anthology. With at least 80 years of combined experience behind them, Corea and Burton delighted the sold-out Anthology audience with a creative blend of originals and highly arranged standards. So, there it is. A lot of other concerts could have made the cut, but these, in my opinion were the 15 most transformative. 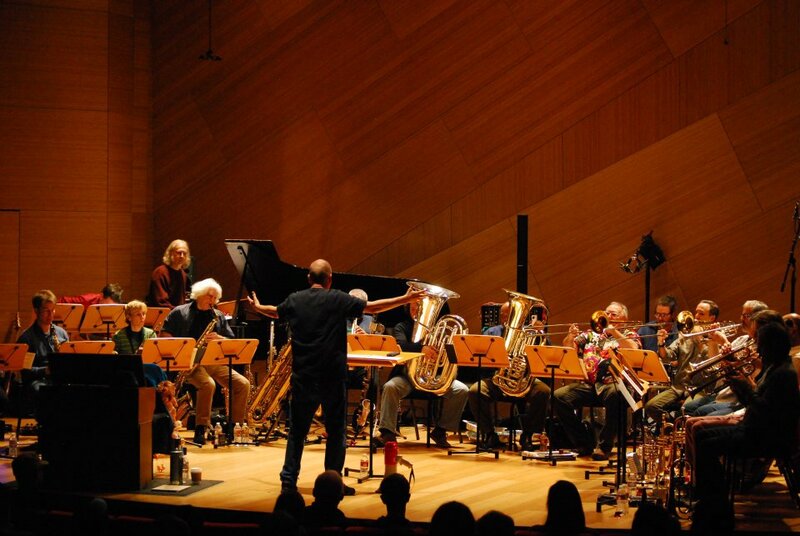 Photo of Jeff Kaiser's Ockodektet by UCSD Music.